Thailand is an exquisite land of ornate temples, mountainous landscapes, and lush islands veiled in mystery. Out of the rich soil of Thailand grows a small chile which is one of the hottest peppers in the world. 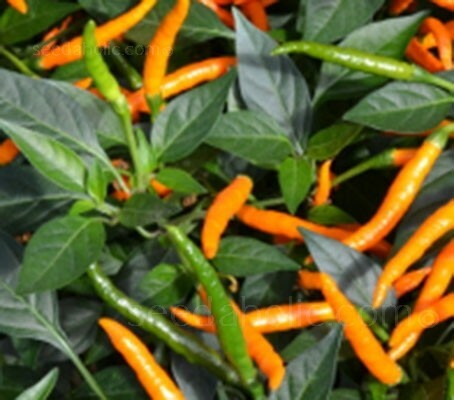 Until just recently, only very hot chiles were grown and used in Thailand. In fact, there is no Thai word for 'sweet pepper'. Several chiles, along with sweet peppers, have now been introduced to Thailand, but the general population has no use for them. A new and very beautiful, flavoursome chilli, ‘Orange Tyger’ offers a great citrus flavour and amazingly complex pungency. The first sharp heat fades quickly to be replaced by a slower more enduring heat. The heat seems to affect different parts of the mouth at different times. A really interesting experience for the chilli lover. Suitable for Northern European cultivation, 'Orange Tyger' produces tidy plants that bear a huge crop of slender chillies. Suitable for growing in a pot or in the greenhouse border, the bright orange colour contrasts very effectively with the rich green foliage. An essential variety for Thai style cooking, and brilliant chopped in stir fries with prawns, chicken or beef, the slender peppers also dry well. A beautiful pepper that is an all-round winner. The peppers will take a few weeks to develop and a further couple weeks to turn from green to gold. Harvest any time after they are fully developed. Use scissors to snip the fruits so you don't damage the plant. After being roasted and peeled, peppers can be preserved by either canning or freezing. Storing poblanos in airtight containers will suffice for several months.